Good Morning Green Panda Readers and Welcome to the first Monday morning in June. I absolutely love this time of year because the weather gets warmer and people get to go outside more often. I enjoy going out for dinner during the summer because all of the patios are open and I love eating outside in the fresh air. When men get ready in the morning all they have to do is take their shower, grab their little wallet, put it in their pocket, and go. 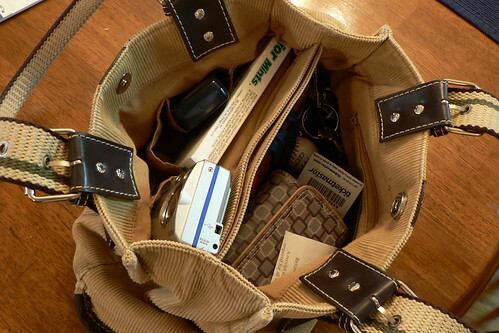 I pack my purse the night before when I am packing my lunch for the next day because when you are a woman your purse holds many things other than just our wallet. As I stared down at my own wallet I realized that it was much bigger than the man’s wallet. Men and Women both need the same necessities to live such as cash, credit cards, and identification; so why are women’s wallets so big and why do we have to carry a purse in addition to our wallet? I want you to take a minute and think about what is in your wallet. In my wallet I currently have two debit cards, one credit card, my driver’s license, my health care card, $15 cash, and some change. I also have various membership and rewards point cards to pharmacies, book stores, and beauty stores. If all I have in my wallet is a few cards and some cash then why is my wallet so big? If we are carrying extra items, cash, and credit cards in our wallet then maybe we are over consuming, over shopping, and over spending in our daily lives. Maybe if we have cash in our wallet we may feel obliged to spend it and if we carry credit cards in our wallet we may feel obliged to shop and charge our purchases. What can you take out of your wallet? If men can live with only a small wallet then I feel that I can too. When I got home I decided to dump everything out of my wallet, cut out the unnecessary items, and carry only the basics. I quickly realized that everything I have in my wallet is absolutely essential to my well being and daily living. Actually that is not true, I guess I could carry only one debit card, one credit card, and one piece of identification; but that means that I would never carry any cash on me and that thought sort of scares me. The other problem with wanting to carry less stuff in my wallet is that women’s wallets are always bigger than men’s wallets. Think about the last time that you bought a wallet, were the women’s wallets much bigger than the men’s wallets? This makes me think that women are supposed to have more stuff than men…that’s the way it has always been and therefore it’s ok.
I’ve noticed both genders can easily sign up for rewards programs and rewards point cards without realizing how much they’re stuffing their wallet or purse. It’s hard to stand at the register and deny 5% back on a purchase with a “quick and easy free sign-up” but in the long run I’ve found it best to only have a few of these types of cards and actually benefit from them than sign up for everything. What rewards cards do you have? and which ones do you use/benefit from most often? I have the Sephora Beauty Insider card which is free and gives clients free gifts with every 100 or 500 points. I also have The Body Shop Love Your Body card which is only $10 and it gives clients $10 free on their birthday. Every time we spend $25 we earn one point, when we earn 4 points we get $15 and when we have 8 points we get $25 and the card automatically renews without any fees.